American germander (Teucrium canadense var. 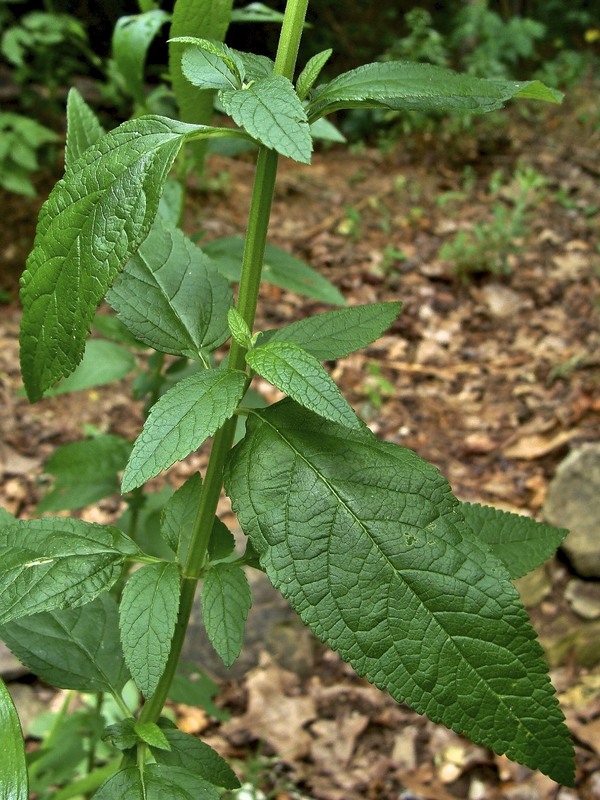 canadense) of the Mint (Lamiaceae) family occurs across the eastern half of the U.S. In Arkansas, it is found statewide. 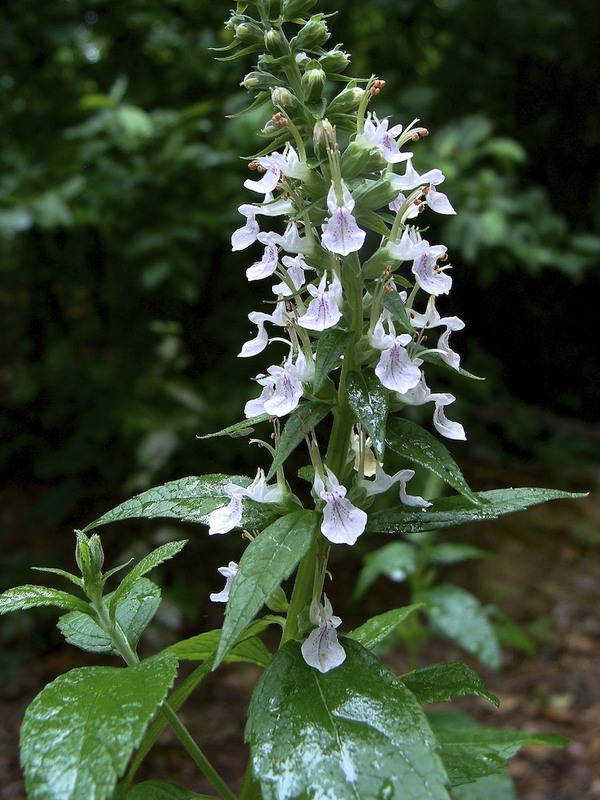 Also known as wood sage and Canada germander, this is the only species of the genus known in Arkansas. The genus is believed named in honor of the first king of Troy (Teucer) for species found in the Mediterranean area. The specific epithet is in reference to this species being originally described from Canada. It is native to moist soils in low areas of woods, thickets, marshes and prairies with full or partial sunlight. This herbaceous perennial, with erect stems that grow from rhizomes, has hollow square stems. Main stems, which may have small axillary branches on the upper portion of the plant and undeveloped branches lower, grow to 3 feet tall. Colonies readily form from the rhizomes. 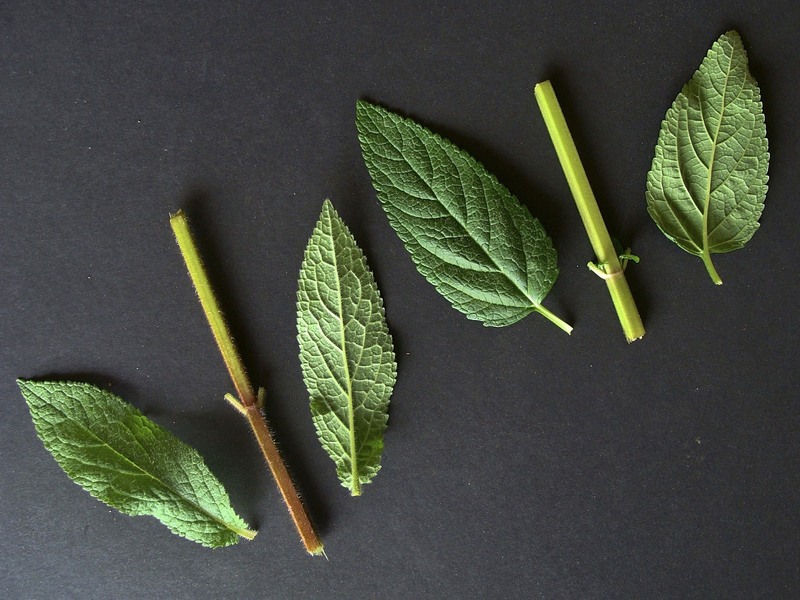 Simple, opposite leaves, with a blade up to 4 inches long and 1¾ inches wide on a petiole up to ½ inch long, are broadly lanceolate with toothed margins. The upper (adaxial) leaf surface is a slightly glossy dark green while the lower (abaxial) surface is a lighter dull green. Leaf pairs are decussate (rotated 90 degrees from one pair to the next). Pinnate leaf veins are recessed on upper surface and raised on lower surface. Primary veins arc toward the leaf apex, with extremities becoming parallel to the leaf margin. Leaves, from mid-leaf, are gently tapered to the tip while the taper to the rounded leaf base is more abrupt. Leaf-blade tissue extends a short distance onto the petiole. Photo 1: New growth of American germander from rhizome. Photo 2: Axillary branches occur along upper portion of stem. Note also the glossy dark green upper leaf surfaces and recessed veins. The inflorescences, with a month-long bloom beginning about mid-June, consist of terminal racemes to 8 inches long with flowers crowded together. Axillary branches, near top of main stem, may also produce short racemes. Single, persistent leaves (bracts) subtend each flower, with bract size decreasing to the apex of raceme. Blooming may be interrupted and plants wilt if soil becomes dry, but plants revive and blooming continues with better moisture. Flowers, when viewed from the side, are about ½ inch long (including the calyx) and ½ inch tall with green, bell-shaped calyxes on short pedicels. Calyxes, horizontal to ascending along the rachis, have three small, broadly triangular upper teeth and two small, broader triangular lower teeth. Photo 3: Note size of leafy bracts subtending each flower and axillary branch at base of raceme to left. Photo: Mid-June. Flowers open from the base of a raceme to the apex in sequential fashion. The corolla is white to light lavender with purple striations and spots on the lower lobe. The trough-shaped descending corolla seems to have “rolled” out of the calyx. The corolla has five lobes: an upper pair of pointed lateral lobes, a middle pair of rounded lateral lobes, and a single significantly larger spoon-shaped lower lobe. In side profile, the lower margin of the corolla arches smoothly downward from the calyx to the beginning of the lower lobe from which point the lower lobe drops directly down and backward. In side profile, the upper margin’s downward trend is interrupted by the up-pointing upper lobes, followed by the out-pointing middle lobes and the downcast lower lobe. Flowers have two pairs of stamens of unequal length with reddish anthers and a pistil with a split stigma. Stamens and the style and stigma are of equal length and arch above the corolla to terminate well above the lower lobe. Filaments of the stamens and the style and stigma have a greenish-white color. Photo 4: Lower lobes of flowers are marked by purple striations and spots. 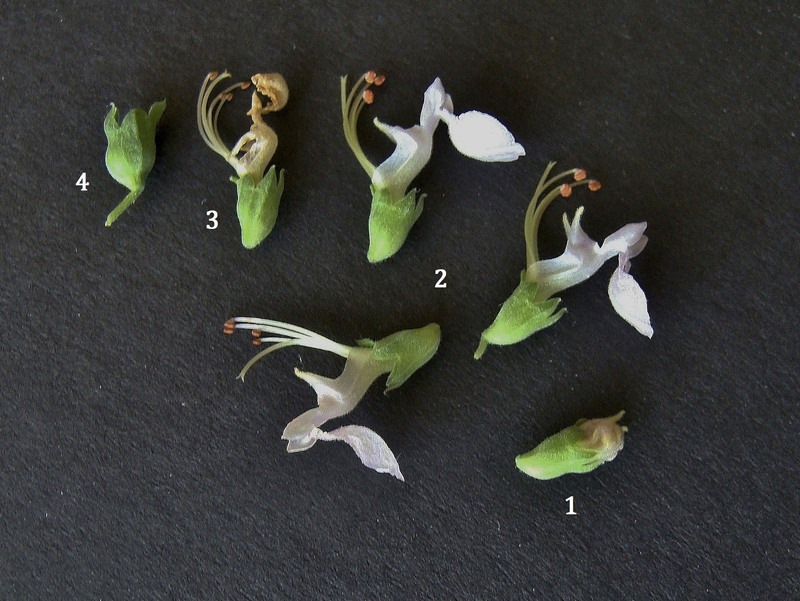 Photo 5: Display showing a flower in bud (See #1), three flowers at anthesis (See #2), a flower in decline (See #3) and a calyx bearing developing seed (See #4). With pollination and fertilization, flowers produce four round, tawny, one-seeded nutlets. Nutlets are held within the persistent calyx until, with drying, they are loosed and dispersed. American germander may be confused with some of the superficially similar hedge-nettles (genus Stachys), also of the Mint (Lamiaceae) family. 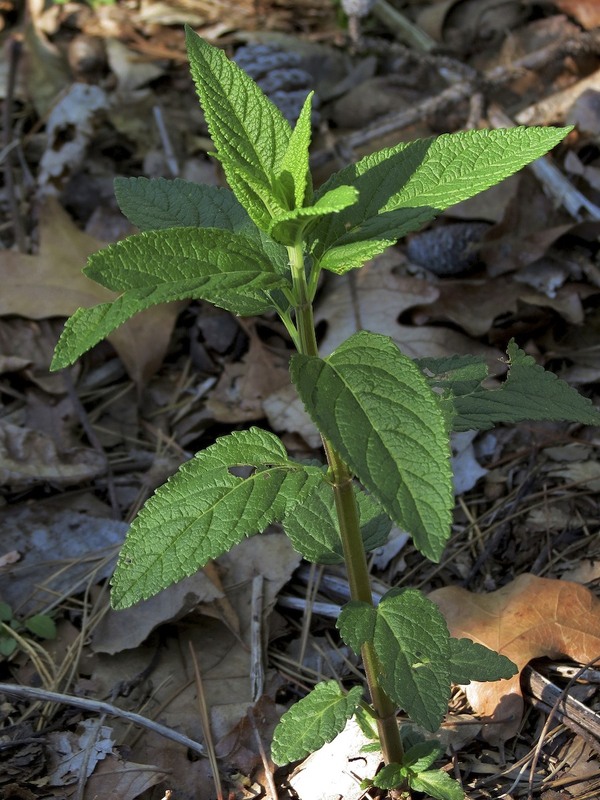 Ouachita hedge-nettle (Stachys iltisii) can be especially confusing. This hedge-nettle occurs primarily in the Ouachita Mountains of Arkansas and Oklahoma, with a few scattered occurrences also in the Arkansas Valley and Ozark Mountains of Arkansas. Like germander, it forms rhizomatous colonies, sometimes in similar habitats. 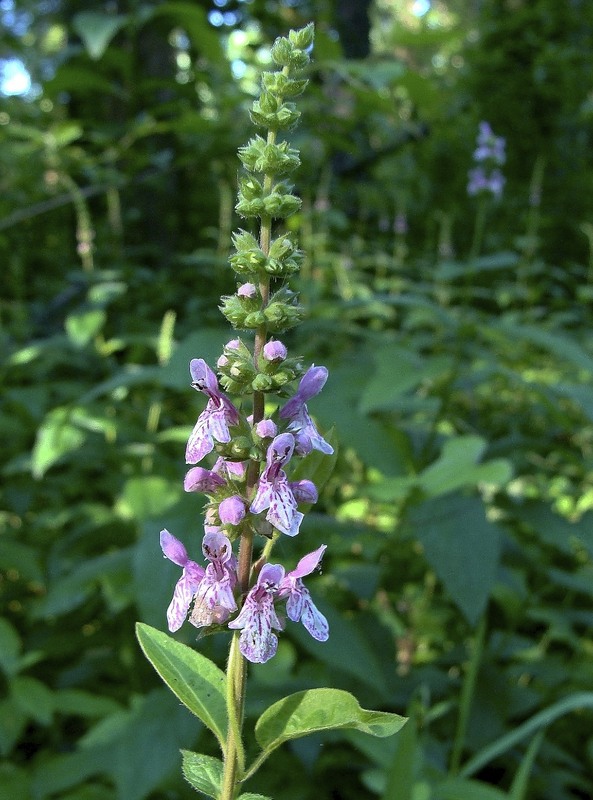 However, Ouachita hedge-nettle can be distinguished by the following: 1) very dense short hairs on upper and lower leaf surfaces as well as on stems, 2) a tapered leaf base, 3) flowers that are arranged in tiers, 4) generally blooming a month earlier, 4) a hood-like upper corolla-lobe and 5) straight lavender to purple filaments and style and stigma that do not project beyond the upper lobe. Photo 6: Comparative display of leaves and stems; Ouachita hedge-nettle on left and American germander on right. 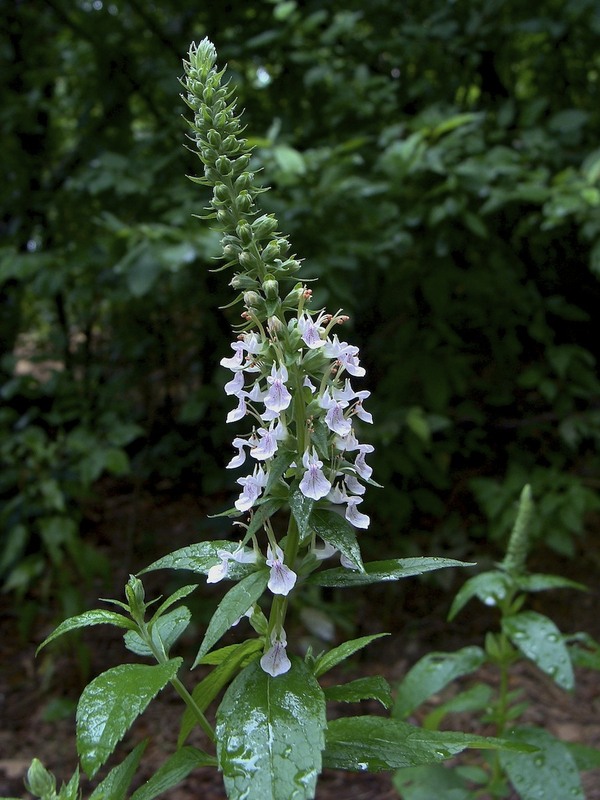 This entry was posted in Know Your Natives, Native Plants, Wildflowers and tagged American germander, Know Your Natives, Lamiaceae, Teucrium, Teucrium canadense var. canadense. Bookmark the permalink.